There have been a few decent to quality wines discovered at Trader Joes and Costco. A month or so I published a blog on the 2009 Kirkland Signature Series Cabernet Sauvignon. After drinking the Kirkland wine I made a recommendation to some of my friends and many of them wandered over to their local Costco and bought some of the wine. I enjoy finding those lower priced wines that you can open and not feel guilty drinking while not breaking the bank! This is my second blog from a wine that came from Trader Joe’s. If you make it to your local Trader Joe’s, I encourage you to take some time and study the wine labels. This 2009 Meritage came from the Rutherford area of Napa Valley. I believe that the fruit had to come from a pretty decent winery. If you do not recall what a Meritage style wine is here is a quick refresher; a Meritage is a proprietary blend of Bordeaux grapes – Cabernet Sauvignon, Merlot, Malbec, Petit Verdot, Cabernet Franc. The percentage of each varietal is decided by the winemaker as they blend the wine. We were over at some friends house for dinner recently and as the evening progressed we drank a few bottles of wine. I suggested that Dave decant the bottle of Trader Joe’s Grand Reserve 2009 Meritage Napa Valley wine he was about to open since this was our first time trying it. I figured that decanting could only open up the wine and make it better. 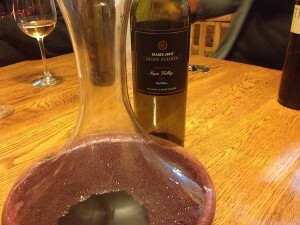 Besides using the decanter we also inserted the “VINOAIR” into the bottle poured the wine into the decanter. Between the VINOAIR and decanter the Meritage, it should open up. We let the 2009 Meritage sit in the decanter for about thirty minutes before pouring it into our glasses. I proceeded to take some notes. The 2009 Meritage had a nice bright Garnet Hue and it looked very young. I could smell Smokey, Earthy, and sweet red fruit but nothing else really jumped out. I could not identify with any specific fruit or vegetable notes. The 2009 Meritage was slightly dry. I could feel the tannins in my mid palate. The finish was medium and it was medium bodied, but I could not taste any fruit. I did note Cocoa, Dark Chocolate and maybe coffee? 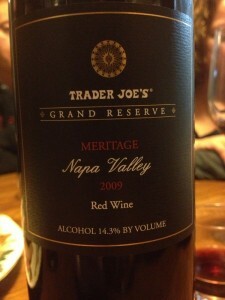 I have to say I was pretty impressed with the Trader Joe’s Grand Reserve 2009 Meritage Napa Valley wine. I do believe using the VINOAIR and decanter assisted in “opening up” the wine. If you are opening up a young red wine (other than a Pinot Noir) I would recommend using a decanter no matter what. 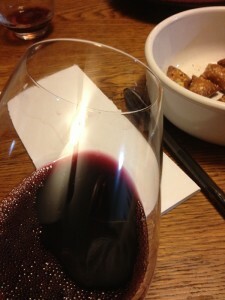 For a wine that is priced less than $15 per bottle, I had to rate it three glasses.